In case you didn’t know, Ozma’s birthday was on Sunday, so I should probably write an Ozma-centered entry. I know I’ve discussed the ruler’s magical powers in the past, but I can’t find a post where I did so. Since Google won’t bother searching my older LiveJournal posts, it’s possible I did write one. If so…well, I guess you’ll be getting the same basic thing again, but that’s pretty much bound to happen now and then. The first indication that Ozma can work magic beyond tools that anyone can use appears in The Emerald City of Oz, in which General Blug claims that Ozma “has certain fairy powers that would render my army helpless,” and General Guph later adds that she “has a fairy wand.” The wand actually first appears in Ozma, which describes it as “an ivory wand that separated at the top into two prongs, the prongs being tipped by the letters “O” and “Z”, made of glistening diamonds set closely together.” John R. Neill instead drew the Z within the O, a pattern that would become symbolic of the land and the series. The wand appears to double as her scepter. I believe Ozma herself is first referred to as a fairy in Scarecrow, and she finally works some magic of her own in Tin Woodman. Her magical ability is introduced quite casually, and no one is surprised at it. David Hulan’s Magic Carpet, which takes place in between Lost Princess and Tin Woodman, reasonably proposes that Ozma traveled to Burzee to learn magic after being kidnapped in the earlier book. In Tin Woodman, she uses her wand to break some of Mrs. Yoop’s transformations, easily turning the Scarecrow and Tin Woodman back into their normal forms, as they were only changed in shape rather than substance. Turning Polychrome back from a canary is more difficult, and requires a series of transformations similar to the one Glinda used on Prince Bobo in Rinkitink. It also involves mixing several powders in addition to simply using the wand. In order to give Mrs. Yoop the form of Woot the Wanderer and then switch it with that of the green monkey (a form that apparently cannot be destroyed), she needs to mix powders in a cauldron of boiling water in addition to making passes with her wand. Before leaving the palace to perform these feats, she prepares in her Magic Room, likely the same as the laboratory said to be in her suite in Lost Princess. Glinda adds extra powers to her repertoire, including warding off a giant spider who is trying to pinch her, changing the color of a crab, creating a tent and food (something the Wizard of Oz does in a more involved way in Emerald City), producing light with the jewel on her wand, making herself and Dorothy invisible, and enchanting Lady Aurex’s house so that Queen Coo-ee-oh could not spy on its inhabitants. In Ruth Plumly Thompson’s books, Ozma generally only does magic with tools, usually the Magic Belt. One exception is in Ozoplaning when she uses her wand to transport herself and several others from Glinda’s palace to the Emerald City. Thompson does hint that Ozma’s fairy nature might give her some extra physical strength, as when she doesn’t get hurt when falling out of bed in Kabumpo, or when it takes longer for her to tire when running back to the city in Lost King. The fairy princess uses more of her own magic in John R. Neill’s books, although since it’s Neill it’s not always that consistent. In Wonder City, she enables Jellia Jamb to talk through her ear when her mouth is sewn together with magical thread, and also prevents her from being hungry until her lips are free. Scalawagons shows her using her scepter to transport a Mifkit out of Oz; while an emerald ring she wears gives the same Mifkit a winder’s outfit, drives off the inflated Bell-Snickle, and gets the attention of everyone in the area. 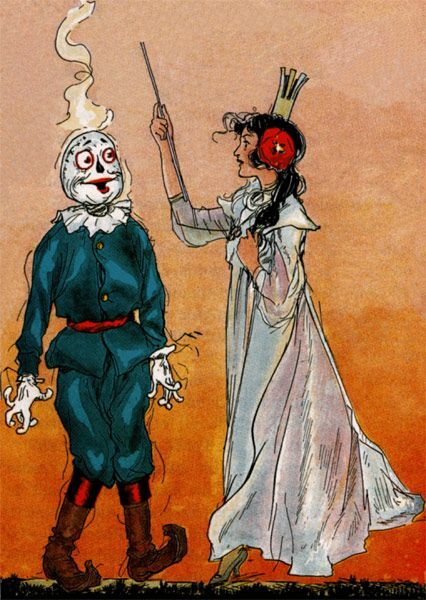 Jack Snow reports in Magical Mimics that Ozma uses her wand to transport herself and Glinda to Burzee, and to extinguish flames created by Queen Ra to burn the Scarecrow. And in Shaggy Man, she rather confusingly refers to the Magic Picture as “my own fairy creation,” which suggests she magically created it before it first appears in Ozma, but there are other possible interpretations. A common interpretation of fairies in the Oz universe is that they have innate magical abilities, although how much varies depending on the particular fairy. In Ozoplaning, the Wizard explains that, to fairies, “working spells and charms just comes natural–like playing the piano by ear.” That’s not to say that they can’t learn new sorts of magic, of course. Polychrome, a sky fairy, doesn’t know any in Road, but does quite a bit of it in Tin Woodman. Fairies also tend to use wands, which likely enhance and focus their power. Queen Dolly of Merryland has a wand that she uses to animate the dolls in her valley. The fairy in The Enchanted Island of Yew who becomes Prince Marvel uses her wand to work various transformations, but is unable to transform herself. Even though the Prince is ostensibly mortal, he still retains some fairy powers, which he uses to counteract poison, capture darts in a sack, give King Terribus of Spor a more pleasing form, and even separate the twin High Ki of Twi into two separate individuals. He also throws a champion wrestler out a window, another possible demonstration of super strength for fairies. Queen Aquareine in The Sea Fairies uses her wand to create circles of protection, change the temperature of the water, and destroy the monster known as the Yell-Maker. Ozma’s cousin Ozana employs “a slender wand which she drew from the folds of her blue dress” to enlarge her swans, and later to break the Mimics‘ enchantment. The King of the Fairy Beavers in Shaggy Man uses “a slender beech rod” as a wand, using it to produce food, generate water to scare off the Flame Folk, make the Cloaks of Visibility vanish, and store Water of Oblivion to use on Conjo. While I don’t recall Polychrome using a wand, she does take a twig in the beak of her canary form when removing Tommy Kwikstep’s extra legs, and she might be using it for much the same purpose. Ozma frequently employs her wand as well, but has to augment it with magic powders during Tin Woodman. Fairies are not the only magic-workers to use wands, but the instruments are obviously a significant part of fairy magic. This entry was posted in Characters, Jack Snow, John R. Neill, L. Frank Baum, Magic, Magic Items, Oz, Oz Authors, Ruth Plumly Thompson, Uncategorized and tagged conjo, david hulan, dot and tot of merryland, fairies, fairy beavers, general blug, general guph, glinda of oz, high ki of twi, jellia jamb, kabumpo in oz, king terribus of spor, magic picture, magic wands, mimics, mrs. yoop, nomes, ozma, ozma of oz, ozoplaning with the wizard of oz, polychrome, prince marvel, queen aquareine, queen dolly, rinkitink in oz, the emerald city of oz, the enchanted island of yew, the lost king of oz, the magic carpet of oz, the magical mimics in oz, the scalawagons of oz, the scarecrow of oz, the sea fairies, the shaggy man of oz, the tin woodman of oz, the wonder city of oz, tommy kwikstep, wizard of oz, woot the wanderer. Bookmark the permalink.